Not The View is proud to say that we are among the venerable old fanzines on the Scottish football scene. However, some twenty-odd years and over two hundred issues old as we may be, we ourselves were predated by some 26 years when it comes to Celtic fan publications. 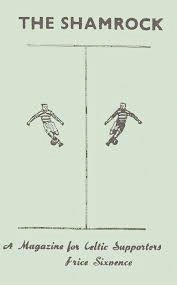 “The Shamrock” was a supporters’ publication aimed directly at the real grassroots Celtic fans, and although it is difficult to pinpoint exactly when it first appeared, its heyday seems to have been between 1961 and 1963. A5 size and consisting of 8-12 pages of typed text which looks as if it might have reproduced by means of Gestetner skins, it was a hard-hitting piece of samizdat that proved to be remarkably ahead of its time. The period from the mid-sixties until the departure of Jock Stein might have silenced many of the club’s critics, but when the Big man departed the scene many of the issues highlighted by this early fanzine reappeared to haunt a board no longer able to paper over the perennial cracks. It was published by the Shamrock Celtic Supporters Club in Edinburgh totally unofficially and was sold outside the stadium on the approaches to Celtic Park. The lack of official sanction will come as little surprise to anyone who manages to get hold of a few copies; the magazine took a virulently anti-board stance and was almost rabid in its condemnation of perceived injustices suffered by Celtic at the hands of the SFA and Scottish referees. Needless to say, it was equally uncompromising when it came to matters relating to Rangers. The magazine reflected the frustration felt by the fans at a time when Celtic had failed to lift a trophy since thrashing Rangers in the 7:1 League Cup final of 1957. One particular source of irritation at the time was the famous ‘Youth Policy’ – get a player for nothing, bring him into the first team then sell him for as much as you could get – felt at the time to be doomed to failure. Though they did give credit where it was due, much of the criticism they directed at the players and the board was highly personal in nature (big Yogi and Bob Kelly were two favourite targets). however, it seems that the views they were expressing on these issues were indeed widely held among the fans at the time, particularly among the habitués of the Jungle. Quite possibly ‘The Shamrock’ may have been one of the understated reasons why the board were so keen to launch Pravda in 1965 as their official organ. As in the 80s, this kind of criticism was given short shrift by the Celtic directors: “It is plain to see how this great club has come down. You get statements like, ‘If you are not happy stay away’” (September 1963). This was typical of the type of scathing criticism this forerunner of the fanzines reserved for the board, then under the chairmanship of Sir Robert Kelly. Articles and letters condemning the youth policy and the club’s unwillingness to spend money on players appeared regularly while the magazine also championed the cause of a certain Baillie James Reilly, a noted critic of the directors in his day, who wanted to usurp power within Parkhead and actively encouraged fans to join the fledgling Celtic Supporters Association, which at that time was perceived as a potential pressure group for upholding the interests of ordinary supporters. “The decline of Celtic has reached such a stage that it cannot be tolerated any longer. The supporters must organise and the lead must be given by influential business and professional men, although every supporter has his part to play and if they could get the backing of old Celtic players in support of Jimmy Delaney’s outspoken criticism then they would certainly be making headway. They have been given a lead by Mr. Reilly. “They could call a mass meeting on Glasgow Green on a Sunday and deliver an ultimatum to the Celtic board to get a real team on the park or get out. At what the club may do? The extraordinary thing was that The Shamrock’s agenda was to prove almost Nostradamus-like in its foresight. I only hope the fans who produced it were around to welcome the Bunnet to their beloved Parkhead. Remember the Lubo 5-1 game? The salutary tale that follows merely illustrates that even when they still existed it wasn’t always fun following the blue team in Glasgow. First comes Santa Claus with your presents, then you have a birthday the very next day. Craig’s fingers tore feverishly at the wrappings as the temperature rose, the beads of perspiration on the wee baldy bit of his head reflecting the twinkling luminosity of the occasion. Like a shark in a feeding frenzy he launched himself wholeheartedly into the pile but seemed to be making no headway – almost as if he had five thumbs on each hand. What makes these occasions worse is the audience participation thing. When you have a crowd cheering you on, encouraging you to do well, you hate to disappoint them. Craig looked at the five thumbs on his right hand. They had metamorphosed into a giant boxing glove. “Aw naw .. “ He looked at his left hand; no, not a boxing glove. It was a prosthetic hook that the character from Peter Pan would have been proud of. Craig looked down at his grotesque appendages and discovered to his delight that his nose-pickers had been restored to their former glory. He thrust his fi ngers hungrily at the package and destroyed the wrapping instantly. A haunted, piercing scream from the depths of his soul was matched by his terrible, troubled face. His uncontrollable sobbing blew apart the thin veneer of normality which had masked his tortured soul for the last seven months. A friendly face gazed into his gutted countenance as the 5-1 video was gently removed from his trembling hands.